Traditions. I’ve been thinking a lot about traditions lately. My husband and I don’t really have a lot of traditions. We’ve been together for five years and married for three and I feel strongly that that’s long enough to have some actual traditions but we just don’t have any. I would assume that part of the reason for this is because in the 5 years we have been together and 3 years of marriage, we’ve lived in a number of cities (Jerusalem, Ann Arbor, and Miami). We haven’t actually been anywhere long enough to set up shop and cultivate some serious traditions. I often read or hear about families who have long-standing traditions of this or that and it sounds really, really nice. I’d like to get me some of those traditions, if you please? Kids: They eat for 2 minutes and play for 2 hours. 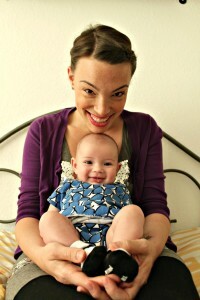 One tradition we won’t drop: Mommy and Siona photo shoot on Thanksgiving (this was last year’s). 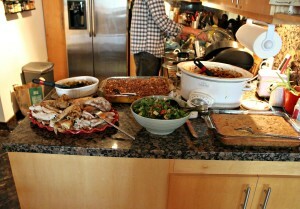 Six adults and one child ate all that delicious, homemade grub. The closest thing my husband and I have come to an actual tradition is hosting Thanksgiving. 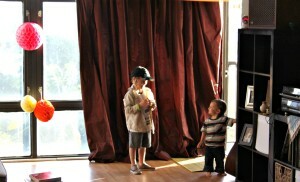 We have hosted every Thanksgiving we’ve had since moving to Miami in December of 2010; all two of them. Each year we’ve had our dear friends (and fellow food-lovers), Adam and Francine (check out her yummy food blog here) and their son, Matan come for dinner and this year is no exception. I have such amazingly fond memories of our Miami Thanksgivings that now, with this impending LA move on the horizon, I feel that what was to become a tradition will be bittersweet this year. Our Miami Thanksgiving is precious. It’s ballsy to say, but no grandparents are allowed. It’s just my our urban family and, now that my husband’s brother and his family have moved here, siblings. But that’s it. We drink beers, we eat A LOT and let the kids run wild. I have no doubts that this year will not disappoint. Well folks, I think it’s safe to say that the “Thanksgivukkah” horse is dead. It is so very, very dead. 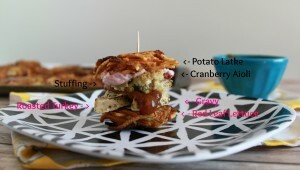 But just in case it isn’t quite dead yet, I went ahead and accepted my own challenge of creating the ultimate Thanksgivukkah sandwich. 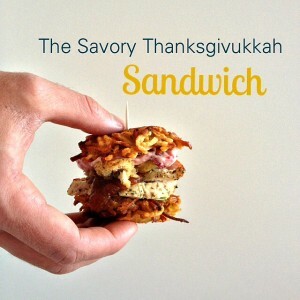 Actually, because I’m a glutton for punishment, I made TWO Thanksgivukkah sandwiches; one to be created using all those glorious leftovers from your Thanksgiving dinner and the other as a beautiful dessert/breakfast/side dish. 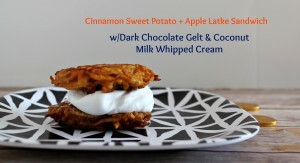 I had posted the question on the Jewhungry Facebook page of whether or not a sandwich with latkes as the ‘bun’ was too much but, come on, if you like Jewhungry on Facebook chances are, you are all in favor of a sandwich that has latkes for a bun (and chances are, we would get along swimmingly). For the sake of my own sanity, I did not roast an entire turkey from scratch nor did I make a batch of my mom’s stuffing recipe. Instead, I used turkey tenderloin and organic, kosher instant stuffing. 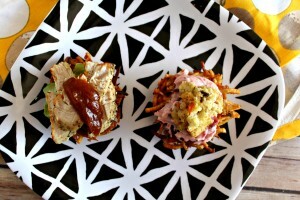 The savory sandwich was, in a word, ridconulous. It tasted so so good. And because I started making them at 7am on Sunday morning, my husband, baby daughter and I ate them for brunch at 11am. This was a true labor of love. 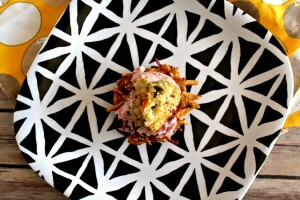 This month’s Kosher Connection round-up theme was “Thanksgivukkah” and well, what better way to mash-up your Thanksgiving turkey and your Chanukkah latke than an actual mash-up . . . on your plate and in your belly. Enjoy! Just in case you need help breaking it down. I think cranberry aioli is really really pretty. (I’m assuming you already having stuffing ready for sandwich-making. This recipe does not include a stuffing recipe but there are PLENTY out there so feel free to Google). Before you start with the latkes, pre-heat the oven to 400 degrees. Line a baking sheet with tin foil and set aside. Wash and dry your turkey tenderloins. Lay side-by-side on the tin foil-lined baking sheet. Drizzle the tenderloins with olive oil and the dry spices listed above. Using a basting brush, brush the olive oil and spices so that they are evenly dispersed on the turkey. Put in oven and roast for 25 – 30 minutes or until juices run clear. Once finished, set aside. 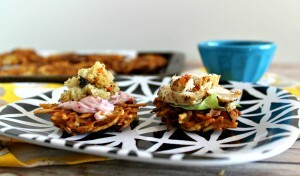 Find the method for the traditional savory latke recipe here. Once you have completed making all your latkes, set to the side an start mixing your cranberry aioli. Combine mayonnaise, cranberry jelly and lemon juice into a bowl and whisk until well combined. Add more cranberry or mayo for your liking. Lay side one onto side two and go. To. Town. And just in case you have room for dessert . . .
Find coconut milk whipped cream ingredients and method here. First, set up a large bowl of ice water in the sink. You will pour the shredded sweet potatoes and apples in the ice bath immediately after shredding. Peel and core apples and sweet potatoes. Using the large holes of a box grater or in a food processor, shred the apples and sweet potatoes (they can be done in the same bowl). Transfer to the ice bath so as to prevent browning. Let soak for a few minutes while you clean out your food processor. Next, transfer to a clean dishtowel or cheesecloth sling and wring out as much juice as you can. Transfer grated sweet potato and apple mixture to a medium bowl and toss with lemon juice. In a small dish, whisk flour, sugar, cinnamon and baking powder and toss with the sweet potatoes and apples, coating them evenly. Whisk eggs in this small dish until lightly beaten and stir into sweet potato-apple-lemon-flour mixture. Add sunflower oil to a large frying pan that reaches a depth of 1/8 inch. Heat slowly over medium to about 365 degrees F. Scoop mixture out with large kitchen spoon (usually I loose the spoon after a while and just get in there with my hands). Squeeze the mixture firmly in your palm over an empty dish to remove any excess liquid. (If you squeezed the potatoes out thoroughly in the cloth, you may not have much excess liquid to squeeze out). Shape the sweet potato/apple mixture into a tightly compacted disk. Continue shaping the latkes in this way, using 2 tablespoons of mixture for each latke. Fry in batches of 4-5 latkes at a time (no more than that – don’t crowd the pan) for 2-3 minutes per side until brown and crispy. Remove the latkes from the frying pan and let oil soak on paper towel. 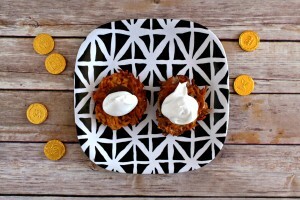 Place a chocolate gelt coin on each latke. 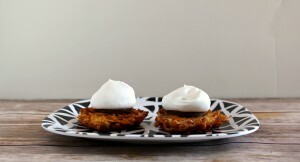 Top with a dollop of whipped cream and either eat separately or place one on top of the other and, I don’t mean to be redundant, go. To. Town. When you can make it a sandwich?